Hi friends, just popping in to say hello! Lots has been going on in the ol’ blogging world and I thought that I’d share a little bit with you. Last week, Jennifer over at Jenuine Happiness and Leslie over at This is for Keeps both nominated me for a Liebster Award. The purpose of the Liebster Award is to find new bloggers and to let your readers know a little more about yourself. You can read my Q&A and discover some random facts about me here. Fellow blogger and friend, Jessica from Little Bits of Joy did a podcast the other day with Chrystie at Living for Naptime. I have to say that I enjoyed every single second. Jessica is so sweet, so funny, and most importantly, down-to-earth. I swear, she’s my sister from another mister or my long lost twin because we have so much in common! So what are you waiting for? Go check her out and give her podcast a listen! And thanks again, Jess, for making me famous the shout out on the podcast. You rock my world! I recently joined a mommy blogger Facebook group and it has been a really great place for advice, networking, and inspiration. Recently, Rebecca over at Caffeine is for Moms compiled heaps of great advice from other mommies in our group to pen her post What I Wasn’t Expecting When I Was Expecting. If you’re expecting for the first time or hoping to have babies down the road, this post is for you… we are discussing all of the things that we wish that we had known before we became parents. Ya know, the stuff that the books and the mommy websites never talk about. Hop on over there if you want to read about the one thing that I wish I had known... it’s probably not anything that has ever even crossed your mind! Chrystie over at Living for Naptime has started a fun Friday link-up where you can link to any of your posts that are applicable to moms and bloggers. Last week, my post about Olivia's Bedroom made the Top 5 for the most clicked links! I just had to share here because a) I’m slightly obsessed with Chrystie because she’s a total rock star in the blogger world and I might have a tiny girl crush on her, b) because her blog is one of my top daily reads so it was an honor to be recognized on there, and c) did I mention that she’s Ashley from the Bachelorette’s sister?! Totally fan-girling over here. If you want to join her link-up each week, check her out! Warning… you’ll want to read every single post that she’s published. Not even kidding. Guess I should have called this Four on Friday because I’m totally out! My brain is on spring break!!!! Oooo I think I'll get out of my blog bubble and check some of these ladies out! And I'll for sure be participating in the Liebster award next week! Have a great weekend, girl! 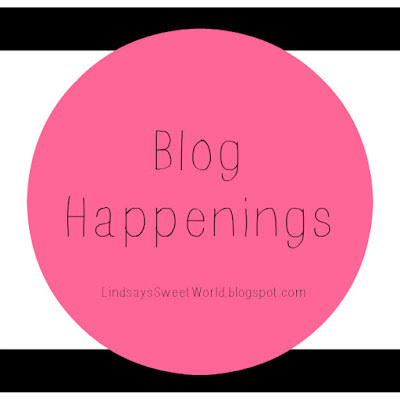 I love finding new bloggers to follow! So much fun! And thank you! Great post, and I will definitely be checking some of these ladies out. What's the Mommy Blogger Facebook Group you joined? Happy, Happy Easter to you and your family. Hope it's a great one! YAY Lindsay! I'm so excited for you about the Liebster award! You so deserve it girl! And I totally loved Jess's pod cast too, loved that she gave you a shout out! Olivias room is darling so of course it made it in the top 5! Love ya girl! Thank you so much, Annie! You're always so sweet! I just joined Chrystie's FB group and started reading her blog. I love it. Congrats on the room and Liebster award!